Nottinghamshire has three large natural geological features. In order of size they are; The Hemlock Stone, Bramcote, The Altar or Druid Stone, Blidworth and Bob’s Rock, Stapleford. Each of these sites has its own geological history and folklore set against the history and archaeology of the County. The Druid Stone has benefitted from of human enhancement. 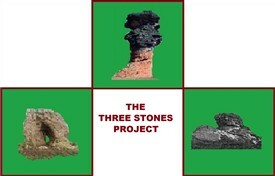 The Three Stones Project, under its Director and instigator Frank Edmund Earp, is a non-commercial project. Based around 3D laser scans of each of the features, carried out by Nottingham Geospacial Institute, (Nottingham University) - the Project is intended to be the largest academic data gathering exercise ever attempted on these sites. Each of the features will be the subject of a full geological, archaeological and landscape survey. All available published and unpublished material relating to the sites will be collected, thus building a complete individual dossier. The Project is intended to publish and contribute this acquired knowledge to the benefit of the site owners, the County as a whole and local community. There are a number of groups and individuals involved in the Project including Broxtowe Borough Council, The Sherwood Forest Trust and Stapleford Community Group. At this current time, the Project is in negotiations for access with the respective site owners of the Druid Stone and Bob’s Rock. However, permission has been granted by Broxtowe Borough Council and the Project will commence with the 3D laser scanning of the Hemlock Stone. This page was added by Joseph Earp on 23/10/2012.